Maximum Overdrive won’t ever go down in Hollywood’s history books as the best adaptation of a Stephen King story. But in some ways, it might be the legendary author’s most personal piece of cinematic output, due to the fact that he directed it (his sole attempt at that career). Yet King has been extremely critical of the film, which sees murder-minded machines come to life. Though it was also overwhelmingly derided by critics, Maximum Overdrive has developed a dedicated cult following over the years—and features one hell of a soundtrack. On the 30th anniversary of the film’s release, we’ve dug up 10 facts about the so-bad-it’s-good sci-fi/horror/comedy. 1. STEPHEN KING WAS STUCK ON HAVING BRUCE SPRINGSTEEN STAR. 2. IT WAS KING WHO PERSUADED AC/DC TO CREATE THE SOUNDTRACK. King has long professed his appreciation for AC/DC and desperately wanted to get them involved in the making of Maximum Overdrive. Legend has it that he wooed them by proving his fandom and singing “Ain’t No Fun Waiting Round to Be a Millionaire” from their 1976 album Dirty Deeds Done Dirt Cheap in its entirety. The band agreed to provide the music for the film, which they released as 1987’s “Who Made Who.” Only the earliest pressings of the album note that it’s the official soundtrack to King’s film. 3. THE HAPPY TOYZ TRUCK IS MODELED ON THE GREEN GOBLIN. The film’s main villain is the ironically named Happy Toyz Truck, a tractor trailer with a (homicidal) mind of its own. 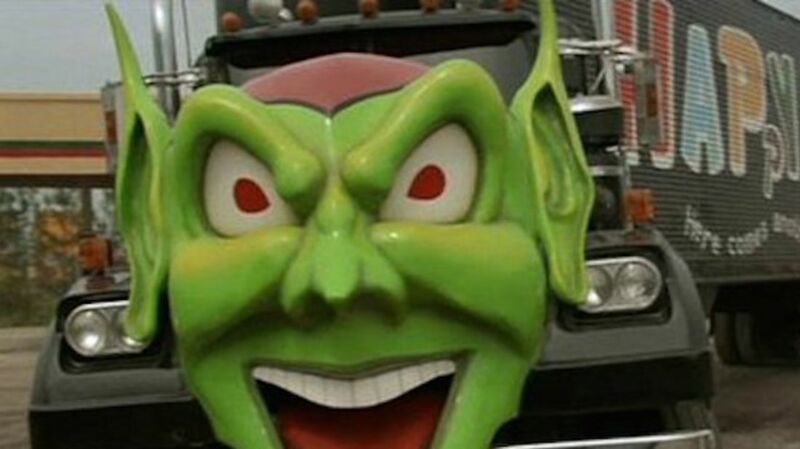 If the goblin-esque mask that sits on the front of the truck looks familiar, that’s because it’s modeled after Marvel’s Green Goblin. 4. THE HAPPY TOYZ GOBLIN IS A REGULAR VISITOR TO HORROR FESTIVALS. Following the film’s completion, the truck—which was pretty damaged from the shoot—was brought to a salvage yard in Wilmington, North Carolina, where filming took place. In 1987, movie memorabilia collector Tim Shockey snatched it up, thinking it would make a fun prop for the video store he owned (at the time, he had never seen Maximum Overdrive). He then set about restoring the Goblin head and, in 2013, brought it to Cincinnati’s HorrorHound Weekend. Since then, it has regularly been spotted at horror festivals and conventions around the country. You can follow its adventures on Facebook and Twitter. 5. YOU MIGHT RECOGNIZE THE SCORE USED IN THE TRAILER. King took a very in-your-face approach to the trailer for Maximum Overdrive, making himself the star of it. In addition to promising the audience that he would “scare the hell out of” them, King also took the opportunity to throw shade at the filmmakers who had previously adapted his works, saying that he decided to direct the film because, “If you want something done right, you ought to do it yourself” and that “I just wanted someone to do Stephen King right.” And he made all these proclamations set to the score of Tommy Lee Wallace’s equally maligned Halloween III: Season of the Witch (1982). 6. KING JUST MAY BE THE FILM’S HARSHEST CRITIC. 7. DRUG ADDICTION MAY HAVE PLAYED A PART IN THE FILM’S EXECUTION. In the mid-1980s, King struggled with drug and alcohol addiction, and was later very frank with how his habitual use of cocaine, Valium, and Xanax impacted his work. He had frequent blackouts and admitted that he doesn’t really remember writing Cujo. As for Maximum Overdrive? “The problem with that film is that I was coked out of my mind all through its production, and I didn’t know what I was doing,” King said. 8. ONE OF THE MOVIE’S HOMICIDAL MACHINES SERIOUSLY INJURED THE CINEMATOGRAPHER. On July 31, 1985, tragedy struck on the set of the film when a radio-controlled lawnmower that was being featured as one of the film’s sentient machines malfunctioned and struck a piece of wood that was being used as a camera support. Though cinematographer Armando Nannuzzi had wanted to remove the blades from the lawnmower before filming, King reportedly wanted it to be as realistic as possible. So when the out-of-control machine struck the wood, the wedge splintered and injured Nannuzzi so badly that he lost his right eye. Nannuzzi ended up suing King and 17 others involved in the making of the film for $18 million, citing that they were “wanton and reckless.” The case eventually settled out of court. 9. BLUE VELVET WAS SHOOTING IN WILMINGTON AT THE SAME TIME. 10. IT WAS REFERENCED BY THE SIMPSONS. In 1999, during its tenth season, an episode of The Simpsons in which Homer temporarily becomes a truck driver was titled “Maximum Homerdrive.” While some might just consider it a fun play on a title, it’s actually more meta than that, as Yeardley Smith, who has been voicing Lisa Simpson since 1987, starred in Maximum Overdrive.